This new Android handset is powered by the MediaTek Helio P20 processor, also featuring 3/4 GB RAM, 32/64 GB internal storage, dual-SIM support, a fingerprint scanner, and more. In China, it will hit the market for $247 USD or $290 USD, depending on the variant. Next to the 5.7-inch Pro 6 Plus phablet, Meizu also unveiled a smaller and cheaper handset earlier today. Dubbed M3X, this 5.5-inch smartphone comes with excellent features for its price, offering an octa-core processor, 4 GB RAM, and 64 GB internal storage for less than $300 USD. 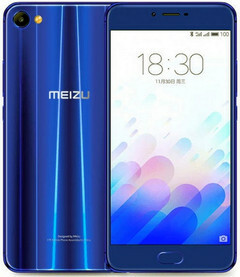 This handset is up for pre-order via Meizu.com and will hit the Chinese market soon as Blue Charm X. The 3 GB/32 GB variant has a price of roughly $247 USD, while the most expensive setup comes with 4 GB RAM and 64 GB internal storage, carrying a price tag of $290 USD. For now, there is no information about its international launch, but we will keep an eye on it since it looks like it might become another worthy choice in the mid-range area of the market.